Surrounded by nature and wonderfully fresh mountain air, you will sooner or later develop an addiction for any kind of recreational activity here at the Platzhirsch in the Zillertal. Both Penken and Ahorn lifts only a 1-minute walk from us will "pick you up" practically right outside the door and take you to the hiking and biking hotspots. There are over 200 km of well-developed hiking paths in the upper Zillertal. The well-known Zillertal side valleys, Zillergrund, Stillupgrund, Zemmgrund, and Tuxertal are located in the middle of the Zillertal Nature Park, which is located right around the corner! On the Penken and Ahorn, which are only 1 minute from the Platzhirsch, you can enjoy numerous mountain tours and high-altitude hikes. "Trail of the Senses", Ahornsee, mountain playground, hiking path with viewing platforms - the Ahorn leisure mountain is a rewarding excursion for the whole family. Visit the Eagle's Stage - here, you can see birds of prey up-close! The loop hiking trail, which is accessible by children's strollers, is a special experience for all ages, and the gondola for the Ahorn is only 1 minute from the Platzhirsch. Adventure-hungry vacationers both young and old have come to the right place at the reservoir of the Penken action mountain. Float over the reservoir in giant, air-filled balls without getting wet. An e-trail course, motor skills course, and mountain playground invite the whole family to participate, and the gondola for the Penken is only 1 minute from the Platzhirsch. 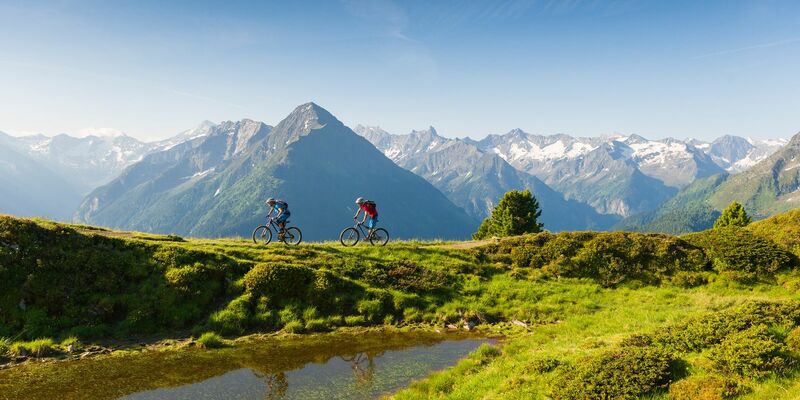 The Mayrhofen biking paradise offers the perfect tour with everything from easy cycling tours in the valley to challenging mountain bike routes on 800 km of bike paths and single trails. Both downhill routes on the Penken, the Himmelfahrt and Höllenritt, will make every biker's pulse race faster with excitement. In Mayrhofen and the surroundings, 130 km of running and Nordic walking routes lead through the especially quiet and pristine countryside. You can choose your favorite among 18 routes and 6 starting point. A highlight for mountain runners is the "Harakiri Hill" with a gradient of 78%. Climbing trains your muscles and endurance and strengthens your well-being. Awaiting you in Mayrhofen is unique climbing enjoyment, and you can choose among 6 different routes. You will find great secured trails in ruggedly romantic natural scenery, which you can climb well with appropriate climbing equipment. A ropes course consists of several masts or trees that are connected by a variety of elements. Located in the middle of the forest is a spectacular high ropes course with 30 exercises between heights of 5 and 14 meters and a view of an 80-meter drop into the gorge. Experience the dream of flying! Enjoy weightless gliding and a gorgeous view of the Zillertal. You will be in the best hands with professional, certified flight instructors at the Zillertal flight school! With tandem paragliding, you have the unique opportunity to get to know Mayrhofen from the air. The sport of tennis is once again enjoying increasing popularity. In Mayrhofen, there are 4 well-maintained clay courts. A top, modern indoor tennis court is located in Zell am Ziller only 8 km from us. On warm summer days, you can relax in the cool water and stretch out on the large sunbathing area. On rainy days, you can enjoy the indoor pool with various water attractions and saunas. Equipped with a GPS device, hiking boots, and alert eyes, you can go on a tour of discovery in Mayrhofen and the surroundings. The electronic scavenger hunt gives you the opportunity to discover new places and search for treasure and is a great way to be active while having fun. The 18-hole championship golf course in Uderns is 20 km from the Platzhirsch. Awaiting you are 65 hectares of golfing enjoyment with practice facility, short course, golf school, and a clubhouse as well as a restaurant of a toque-awarded level.